It's release day for "Josie's Dream", part of the "Grandma's Wedding Quilts" series. If you haven't already made your purchase at $.99, do so before it returns to the regular price on January 18, 2017. I had the good fortune to grow up in the tri-state area composed of Illinois, Missouri and Iowa. The medical school Josephine Forrester attend was located in Keokuk, Iowa. I'd walked those streets many a time in my childhood. Keokuk has an interesting history, located on the Mississippi where it is almost a mile wide. From its early days to the present, many people have landed in this town. It has one of the few National Cemeteries west of the Mississippi and was a place where soldiers and supplies for the Civil War departed, along with the wounded of that war arrived. Samuel Clemens also knows as Mark Twain, made his home in this town in 1857, working alongside his brother Orion in the printing business. The Medical School Josephine attended was part of the University of Iowa, the first public university to be co-ed. The Keokuk School of Physicians and Surgeons began life in Indiana but by November of 1850, the school held its first session in Keokuk, Iowa in a seven story building located at the corner of Third and Paleon Streets. It continued until 1908 when it merged with Drake University in Des Moines, Iowa. Hope you have enjoyed the first eight offerings in the sweet, fun series of the grandchildren of Grandma Mary. 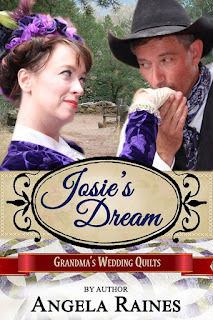 Since today is the release day for Josie's Dream, I want to thank my cover models, Camille, Chris and my photographer Nadine and of course Shanna Hatfield for putting my photos into the amazing cover you see at the beginning of this post. I also want to thank the other authors for their encouragement and support. This book would not be here without them. Pulling up the hem, Josie bent down to see a pair of gold eyes look at her from a coat of dark gray. “How did you get there?” Josie asked. Lifting the small creature up, she moved to the door. The kitten clung to her shoulder, headbutting her chin, loud purrs sounding in her ear. “You know this because...?” Josie asked. Josie reached up, gently pulling the kitten forward for a better look. She’d always enjoyed animals, but a cat? “You’d make me feel better if you...” the clerk began, then sneezed. “Thank you,” Josie replied, as she gathered her bags and started up the stairs. Josie opened her room door, but before she could close it, the kitten bounded in, scratching its way to the middle of the bed. Just then, Josie heard laughter, followed by cries of pain. Grabbing her bag, she closed the door and headed downstairs again, determined to help whoever was hurt. The Grandma's Wedding Quilts books will be released at the rate of one per day. You will want to read all the books in the series. To find then all in one location, please visit and follow the series page on Amazon: http://amzn.to/2iVfF1h . Second, join the SweetAmericana Book Club group on Facebook: http://bit.ly/2jnVw7y. The mystery is solved. NOW I know why you have had an interest and fascination in women doctors of a century ago or further back. You grew up around that old medical school which was among the first to accept female students studying to become doctors. Great bit of information. Thanks for sharing. Best of success on your book. Thank you Margie. I fell in love with the characters in this story, and believe me they had a mind of their own. *Smile*. Happy Release Day to you! Such a great back story to your story! Happy release day, Dori! CONGRATULATIONS! I'm snapping this up. Looks like a wonderful story and a wonderful series! Thank you Cheryl. It was a challenge I wanted to try. It was also a great learning experience. I appreciate all you do even more after this. Kudos to you, Doris! This sounds just as wonderful as your other stories. And haiku. And photographs. Haven't seen you act or sing yet, but I will. You know it's gonna happen. Happy new release day! Doris, I love that cover. What a great idea behind this series. My grandmother made quilts for all of her grandkids when they married. I no longer have mine because of a house fire, but I treasured it. I was happy to see the book was still 99 cents today. Thank you Livia.I'm so sorry you lost such a precious item. I'm fortunate to have a couple of quilts my great grandmother made. They did survive a house fire, but are a bit scorched. Glad you like the idea. Once it was formed, the stories just took off. It has been a great learning experience for me, and I'm glad I made the effort. Makes me appreciate what you do. I left the special price due to the lateness of some of my post. I was called into work, so didn't want to short anyone because of my schedule. I really enjoyed the info about the school. I am very interested in learning all I can about medicine in the 1860's and 70's. I know it eas really difficult to research this because it's hard to find research material, especially about the first women doctors. I am writing an original Western TV pilot script and series which has a lot to do with medicine as one of the character's father was a well-known doctor and surgeon who became more famous in his efforts during the Civil War. My script takes place in 1867 and follows three Civil War buddies who co-own a ranch after the war. The one ehose father us the doctor never wanted to go to medical school like his dad though he was talented. It causes a big fight, but he finally goes to Havard Medical School only to drop out a semester before graduating because he did not like it and the war breaks out. Of course, I have several major storylines and many minor ones. One of the story arcs is told through flashbacks to the actual war which is also a fascinating but often complicated sunject. I bought your book and really look forward to reading about this woman doctor. I loved Dr. Quinn, so I guess O have always been interested in 19th Century medicine. Sorry, I forgot to edit. And I do thank you for giving Josie's story a read. I will be reformatting, for the version uploaded didn't format correctly.